Orion constellation is one of the brightest and best known constellations in the night sky. It lies on the celestial equator. Orion has been known since ancient times. The constellation is also known as the Hunter, as it is associated with one in Greek mythology. It represents the mythical hunter Orion, who is often depicted in star maps as either facing the charge of Taurus, the bull, pursuing the Pleiades sisters, represented by the famous open cluster, or chasing after the hare (constellation Lepus) with his two hunting dogs, represented by the nearby constellations Canis Major and Canis Minor. The constellation Orion contains two of the ten brightest stars in the sky – Rigel (Beta Orionis) and Betelgeuse (Alpha Orionis) – a number of famous nebulae – the Orion Nebula (Messier 42), De Mairan’s Nebula (Messier 43) and the Horsehead Nebula, among others – the well-known Trapezium Cluster, and one of the most prominent asterisms in the night sky – Orion’s Belt. Orion is the 26th constellation in size, occupying an area of 594 square degrees. It is located in the first quadrant of the northern hemisphere (NQ1) and can be seen at latitudes between +85° and -75°. The neighboring constellations are Eridanus, Gemini, Lepus, Monoceros and Taurus. Orion belongs to the Orion family of constellations, along with Canis Major, Canis Minor, Lepus and Monoceros. The constellation contains three Messier objects – Messier 42 (M42, NGC 1976, Orion Nebula), Messier 43 (M43, NGC 1982, De Mairan’s Nebula), and Messier 78 (M78, NGC 2068) – and has seven stars with known planets. 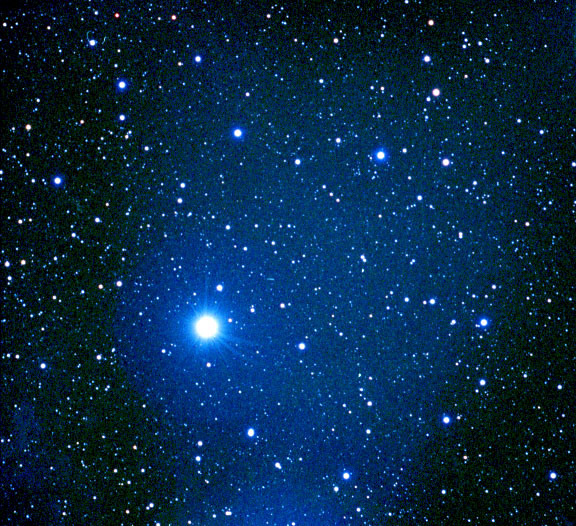 The brightest star in the constellation is Rigel, Beta Orionis, with an apparent magnitude of 0.18. Rigel is also the sixth brightest star in the sky. The second brightest star in Orion, Betelgeuse, Alpha Orionis, has an apparent magnitude of 0.43 and is the eighth brightest star in the night sky. There are two meteor showers associated with Orion, the Orionids and the Chi Orionids. The Orionid meteor shower reaches its peak around October 21 every year. In Greek mythology, the hunter Orion was the most handsome of men. He was the son of the sea god Poseidon and Euryale, the daughter of King Minos of Crete. In Homer’s Odyssey, Orion is described as exceptionally tall and armed with an unbreakable bronze club. In one myth, Orion fell in love with the Pleiades, the seven sisters, daughters of Atlas and Pleione. He started pursuing them and Zeus scooped them up and placed them in the sky. The Pleiades are represented by the famous star cluster of the same name, located in the constellation Taurus. Orion can still be seen chasing the sisters across the sky at night. In another story, Orion fell in love with Merope, the beautiful daughter of King Oenopion, who didn’t return his affections. One night, he had too much to drink and tried to force himself on her. The king, enraged, put out Orion’s eyes and banished him from his land, the island of Chios. Hephaestus felt sorry for the blind, wandering Orion and offered one of his assistants to guide the hunter and act as his eyes. Orion eventually encountered an oracle that told him if he went east toward the sunrise, his sight would be restored. Orion did so and his eyes were miraculously healed. Orion is often shown as facing the attack of a bull, yet there are no myths in Greek mythology telling any such tale. When describing the constellation, the Greek astronomer Ptolemy describes the hero with a club and lion’s pelt, both of which are usually associated with Heracles, but there is no evidence in mythology books of a direct relation between the constellation and Heracles. However, since Heracles, the most famous of Greek heroes, is represented by the much less conspicuous constellation Hercules, and since one of his tasks was to catch the Cretan bull, there are at least hints of a possible connection between the two. Most myths about Orion’s death involve a scorpion, but the stories differ from one mythographer to another. In one tale, Orion boasted to the goddess Artemis and her mother Leto that he could kill any beast on earth. The Earth Goddess heard him and sent a scorpion, which stung the giant to death. In another story, he tried to force himself on Artemis and she was the one who sent the scorpion. In yet another account of his death, Orion was stung while trying to save Leto from the scorpion. All myths of Orion’s death share the same outcome: Orion and the scorpion were placed on opposite sides of the sky, so that when the constellation Scorpius rises in the sky, Orion sets below the horizon in the west, fleeing from the scorpion. However, there is also a myth that does not involve a scorpion: Artemis, the goddess of hunting, fell in love with the hunter and, to stop her from giving up her vows of chastity, her brother Apollo dared her to hit a small target in the distance with her bow and arrow. Not knowing that the target was Orion, who was enjoying a swim, she hit it in a single shot, killing her would-be lover. Devastated by his death, she placed Orion among the stars. 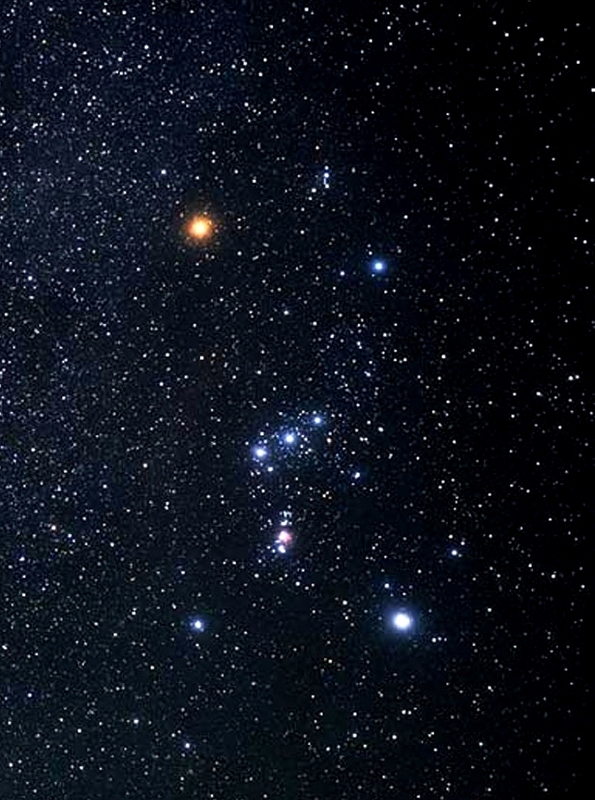 Orion is a well-known constellation in many cultures. In Australia, the stars forming Orion’s Belt and sword are sometimes called the Pot or the Saucepan. In South Africa, the three stars of Orion’s Belt are known as Drie Konings (the three kings) or Drie Susters (the three sisters). In Spain and Latin America, the stars are called Las Tres Marías, or The Three Marys. Babylonians knew Orion as MUL.SIPA.ZI.AN.NA or The Heavenly Shepherd (The True Shepherd of Anu) in the Late Bronze Age and associated the constellation with Anu, the god of the heavenly realms. Egyptians associated it with Osiris, the god of death, afterlife and rebirth. Orion was also identified with Unas, the last Pharaoh of the Fifth Dynasty, who was said to have eaten the flesh of his enemies and devoured the gods themselves to become great and bring inheritance of his power. According to myth, Unas travels through the sky to become the star Sabu, or Orion. Because pharaohs were believed to be transformed into Osiris after death, some of the greatest pyramids – the ones at Giza – were built to mirror the pattern of the stars in the constellation. To make the transformation easier, the air shaft in the King’s Chamber in the Great Pyramid was aligned with the star Alnitak, Zeta Orionis, the easternmost star in Orion’s Belt. The Aztecs called the stars of Orion’s Belt and sword the Fire Drill; their rising in the sky signalled the beginning of the New Fire ceremony, a ritual Aztecs performed to postpone the end of the world. In Hungarian mythology, Orion is identified with Nimrod, a famous hunter and father of Hunor and Magor, the two twins also known as Hun ad Hungarian. In Scandinavian tradition, the constellation is associated with the goddess Freya and called Frigg’s Distaff (Friggerock), after the tool she used for spinning. The Chinese knew the constellation as Shen, a great hunter or warrior. Another ancient legend dates back to the second millennium BC. The Hittites (a Bronze Age people of Anatolia, the region comprising most of present-day Turkey) associated the constellation with Aqhat, a famous mythical hunter. The war goddess Anat fell in love with him, but after he refused to lend her his bow, she tried to steal it. However, the man she sent to get the bow messed up the assignment pretty badly, killing Aqhat and dropping the bow into the sea. This is why, according to the myth, the constellation drops below the horizon for two months in the spring. Rigel is the brightest star in the constellation. With an apparent magnitude of 0.18, it is also the sixth brightest star in the sky. Even though it does not have the designation alpha, it is almost always brighter than Betelgeuse, Alpha Orionis. Rigel is really a star system composed of three stars. It has been a known visual binary since 1831, possibly even earlier, when F. G. Struve first measured it. Rigel is surrounded by a shell of expelled gas. The name Rigel comes from the Arabic phrase Riǧl Ǧawza al-Yusra, which means “the left foot of the central one.” Rigel marks Orion’s left foot. Another Arabic name for the constellation is iǧl al-ǧabbār, or “the foot of the great one.” The star’s other two variant names, Algebar and Elgebar, are derived from this phrase. Rigel is a blue supergiant. It belongs to the spectral type B8lab and is 772.51 light years distant. It has 85,000 times the luminosity of the Sun and 17 solar masses. It is classified as a slightly irregular variable star, with its luminosity varying from 0.03 to 0.3 magnitudes over 22 – 25 days. The primary component in the system, Rigel A, is 500 times brighter than Rigel B, which is itself a spectroscopic binary star. Rigel B has a magnitude of 6.7. It consists of a pair of B9V class main sequence stars that orbit a common centre of gravity every 9.8 days. 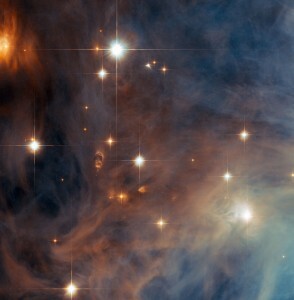 Rigel, Beta Orionis, is associated with several nearby dust clouds which it illuminates. The most famous one is IC 2118, also known as the Witch Head Nebula, a faint reflection nebula located about 2.5 degrees to the northwest of Rigel, in the constellation Eridanus. Rigel is a member of the Taurus-Orion R1 Association. 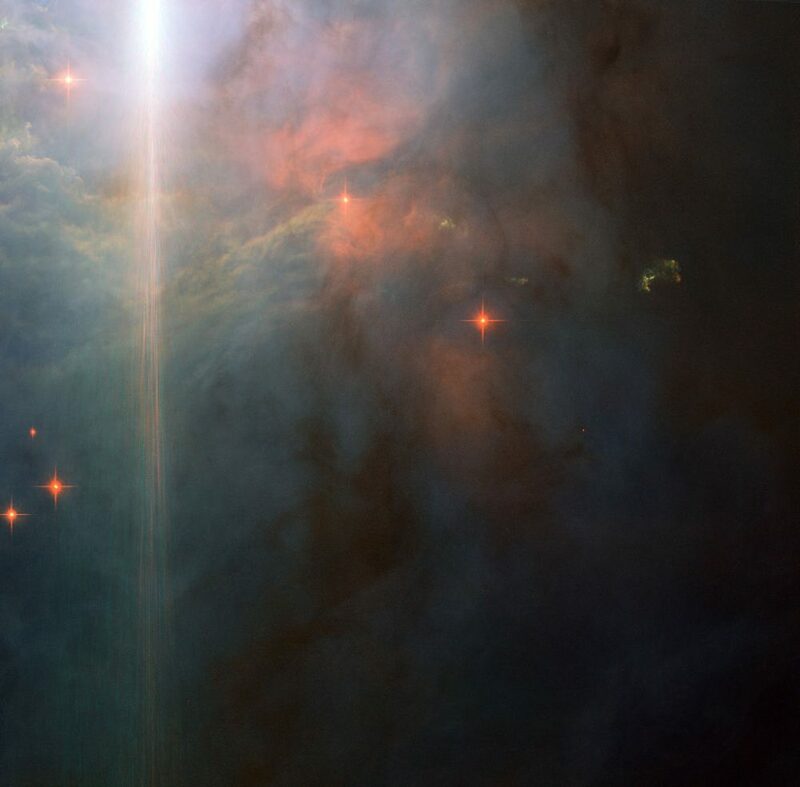 It was considered by some to be an outlying member of the Orion OB1 Association, a group of several dozen hot giants belonging to the spectral types O and B, located in the Orion Molecular Cloud Complex. However, the star is too close to us to be a real member of that particular stellar association. Rigel is only about 10 million years old. Eventually, it will grow into a red supergiant, one very similar to Betelgeuse. Betelgeuse is the second brightest star in Orion and the eighth brightest star in the sky. It is a red supergiant, belonging to the spectral class M2lab. The suffix -ab indicates that Betelgeuse is classified as an intermediate luminous supergiant, one not as bright as others such as Deneb in the constellation Cygnus. Some recent findings, however, suggest that the star emits more light than 100,000 Suns, which would in fact make it more luminous than most stars in its class, so the classification is likely outdated. The star has an apparent magnitude of 0.42 and is approximately 643 light years distant. Betelgeuse is one of the most luminous stars known. It has an absolute magnitude of -6.05. Betelgeuse, or Alpha Orionis, is also one of the largest stars known, with an apparent diameter between 0.043 and 0.056 arc seconds. It is difficult to get an accurate measurement because the star appears to change shape from time to time and, as a result of a huge mass loss, it has a large envelope surrounding it. Alpha Orionis is classified as a semi-regular variable star. Its apparent magnitude varies from 0.2 to 1.2, which means that Betelgeuse occasionally outshines its bright neighbour Rigel. This, however, only happens very rarely. The star’s variation in brightness was first noted by Sir John Herschel in his Outlines of Astronomy in 1836. Betelgeuse is believed to be about 10 million years old, which is not much for a red supergiant, but the star is thought to have evolved very rapidly because of its enormous mass. It will likely explode as a supernova in the next million years. When it does, it will be easy to find in the sky, not just at night, but also in broad daylight. At its current distance from the solar system, the supernova would shine brighter than the Moon and be the brightest ever recorded supernova in history. The origin of the name Betelgeuse is not entirely certain. The last part, -elgeuse, is derived from the Arabic name for the constellation, al-Jauzā’, which was a feminine name from old Arabian legends and can be roughly translated as “the middle one.” The most widely accepted explanation is that the name is a corruption of the Arabic phrase Yad al-Jauzā’ , or the Hand of al-Jauzā’, which is to say, the hand of Orion, which became Betelegeuse through a mistransliteration into medieval Latin, with the first Arabic letter standing for y being mistaken for the one for b, which led to the name Bait al-Jauzā’, or “the house of Orion” during the Renaissance. This eventually led to the star’s modern name, Betelgeuse. Betelgeuse is part of two prominent winter asterisms: the Winter Triangle and the Winter Hexagon. The other two stars forming the Winter Triangle, also known as the Great Southern Triangle, are Sirius and Procyon, the brightest stars in the constellations Canis Major and Canis Minor respectively. The same stars are also part of the Winter Hexagon, along with Rigel, Aldebaran in the constellation Taurus, Capella in Auriga, and Pollux and Castor in Gemini. Bellatrix, sometimes also known as the Amazon Star, is the third brightest star in Orion and the 27th brightest star in the sky, only slightly dimmer than Castor in Gemini. Its name comes from the Latin word for “the female warrior.” It has a mean apparent magnitude of 1.64 and is approximately 240 light years distant. Bellatrix is a hot, luminous blue-white giant star, classified as an eruptive variable. Its magnitude varies between 1.59 and 1.64. The star belongs to the spectral class B2 III. It is one of the hotter stars visible to the naked eye. It emits about 6,400 times more light than the Sun and has eight or nine solar masses. Within a few million years, Bellatrix will become an orange giant and eventually a massive white dwarf. Before its own variability was confirmed, Gamma Orionis was used as a standard for stellar luminosity, one against which other stars were compared and checked for variability. Orion’s Belt is one of the best known asterisms in the night sky. It is formed by three bright stars in the constellation Orion: Mintaka (Delta Orionis), Alnilam (Epsilon Orionis), and Alnitak (Zeta Orionis). Mintaka is a multiple star, classified as an eclipsing binary variable. The primary component is a double star consisting of a class B giant and a hot class O star which orbit each other every 5.63 days and eclipse each other slightly, causing a 0.2 magnitude drop in luminosity. The system also contains a magnitude 7 star separated by about 52” from the primary component, and a very faint 14th magnitude star in between. Mintaka is approximately 900 light years distant. Its brightest components are both roughly 90,000 times as luminous as our Sun and have more than 20 solar masses. They will both end their lives in violent supernova explosions. In the order of brightness, the apparent magnitudes of the components are 2.23 (3.2/3.3), 6.85, 14.0. 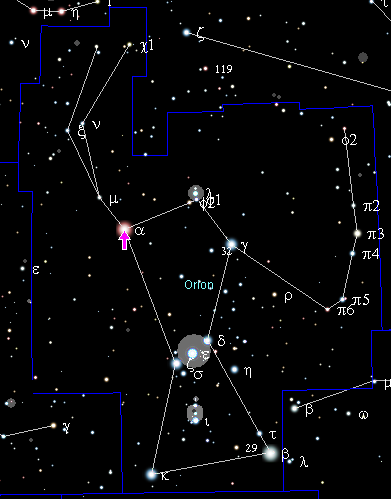 Mintaka is the faintest of the three stars in Orion’s Belt and the seventh brightest star in Orion. It is the closest bright star to the celestial equator: it rises and sets almost exactly east and west. Alnilam, Epsilon Orionis, is a hot, bright blue supergiant. It has an apparent magnitude of 1.70 and is approximately 1,300 light years distant. It belongs to the spectral class B0. 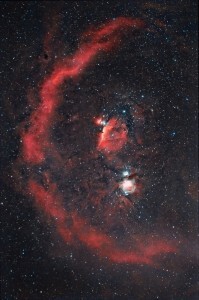 Alnilam and NGC 1990, image: Glen Youman at astrophotos.net. Alnilam is the central star in Orion’s Belt. It is the fourth brightest star in the Orion constellation and the 30th brightest star in the night sky. It radiates about 375,000 solar luminosities. The star’s Flamsteed designation is 46 Orionis. Alnilam is surrounded by the reflection nebula NGC 1990, a molecular cloud illuminated by the light emitted by the star. The wind blowing from the star’s surface has the speed of 2,000 kilometres per second. The star’s estimated age is around four million years. It is losing mass and its internal hydrogen fusion is shutting down. Alnilam will soon evolve into a red supergiant, one much brighter than Betelgeuse, and eventually explode as a supernova. The brightest component in the system, Alnitak A, is yet another hot, blue supergiant, one with an absolute magnitude of -5.25. The star has a visual magnitude of 2.04 and belongs to the spectral class O9. It is the brightest O class star known. It is in fact a close binary star, composed of the O9.7 class supergiant, one with a mass 28 times solar, and a blue dwarf belonging to the spectral class OV, with an apparent magnitude of about 4. The dwarf was first discovered in 1998. Alnitak is the easternmost star in Orion’s Belt. The system lies next to the bright emission nebula IC 434. The nebula was first discovered by William Herschel on February 1, 1786. Kappa Orionis, or Saiph, is the southeastern star of Orion’s central quadrangle. It is the sixth brightest star in the constellation, with an apparent magnitude of 2.06. The star is approximately 720 light years distant. Saiph is a blue supergiant, belonging to the spectral class B0.5. Its name is derived from the Arabic phrase saif al jabbar, which means “the sword of the giant.” Like many other bright stars in Orion, Saiph too will end its life in a supernova explosion. The primary component in the Iota Orionis system is a massive spectroscopic binary star that has an eccentric 29-day orbit. The system is composed of a blue giant belonging to the spectral class O9 III and a class B1 III star. The binary is a strong X-ray source as a result of the collision of the stellar winds coming from the pair. Iota Orionis has an apparent magnitude of 2.77 and is approximately 1,300 light years distant from the solar system. Lambda Orionis is blue giant belonging to the spectral type O8III, approximately 1,100 light years distant. It has a visual magnitude of 3.39. The star’s traditional name, Meissa, comes from the Arabic Al-Maisan, which means the shining one. Lambda Orionis is also sometimes called Heka, from the Arabic Al Hakah, or a white spot, referring to the Arabic lunar mansion that includes both Lambda and Phi Orionis. Meissa is really a double star. The companion, a hot blue-white dwarf belonging to the spectral class B0.5V, has an apparent magnitude of 5.61 and is separated from the brighter component by 4.4 arc seconds. Phi Orionis refers to two star systems in Orion, Phi-1 Orionis and Phi-2 Orionis, separated by 0.71° degrees. Phi-1 Orionis is a double star approximately 1,000 light years distant. The main component is a main sequence star belonging to the spectral type B0, with an apparent magnitude of 4.39. Phi-2 Orionis is a K0 class giant approximately 115 light years distant. It has an apparent magnitude of 4.09. Pi Orionis is a relatively loose group of stars that constitute Orion’s shield. Unlike most binary and multiple stars that share the same Bayer designation, the stars in the Pi Orionis system are fairly wide apart. Pi-1 Orionis and Pi-6 Orionis are separated by almost nine degrees. Pi-1 Orionis (7 Orionis) is the faintest star in the system. It is a white main sequence dwarf with an apparent magnitude of 4.60, approximately 120 light years distant. The star belongs to the spectral type A0. Pi-2 Orionis (2 Orionis) is also a main sequence dwarf, belonging to the spectral class A1Vn. It is located 194 light years from Earth and has a visual magnitude of 4.35. Pi-4 Orionis (3 Orionis) has an apparent magnitude of 3.69 and is 1,250 light years distant. It is one of the most luminous stars known. It is really a spectroscopic binary star, composed of two hot class B2 stars, a giant and a subgiant. They make a very close pair and cannot be resolved, even through a telescope. Only their spectra give away the fact that they are two stars, not one. The stars orbit each other with a period of 9.5191 days. Both of them have masses about 10 times that of the Sun and their respective luminosities are 16,200 and 10,800 times that of the Sun. Pi-5 Orionis (8 Orionis) has an apparent magnitude of 3.70 and is 1,342 light years distant from the solar system. Pi-6 Orionis (10 Orionis) is a bright orange giant belonging to the spectral class K2II. It is a variable star with a mean visual magnitude of 4.45. The star lies 954 light years from Earth. Eta Orionis is an eclipsing binary star system that consists of two blue stars, belonging to the spectral type B0.5V, approximately 900 light years distant. It belongs to the Orion Arm, which is a minor spiral arm of the Milky Way, sometimes also known as the Orion Spur or the Orion-Cygnus Arm. 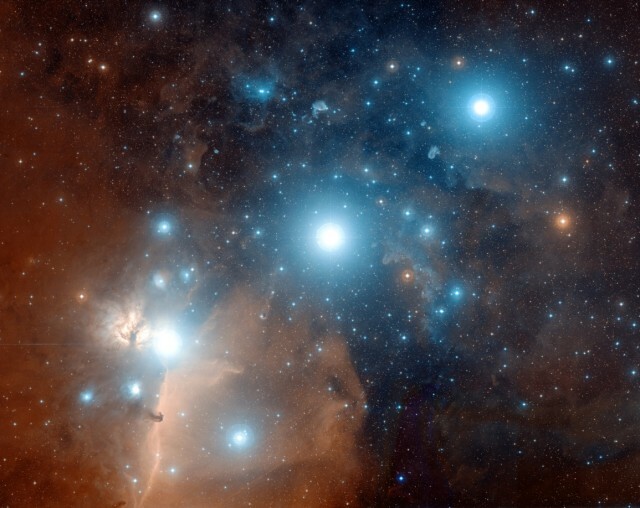 Eta Orionis, located just to the west of Orion’s Belt, has several traditional names: Saiph (which it shares with Kappa Orionis), Algjebbah, and Ensis, which means “sword” in Latin. The star is classified as a Beta Lyrae variable, a type of close binary star with variations in brightness caused by one component occasionally passing in front of the other one. It has a visual magnitude of 3.38. Sigma Orionis is a multiple star system in Orion constellation. It consists of five stars located a little south of Alnitak. The components’ apparent magnitudes range from 4.2 to 6.7. The system is approximately 1,150 light years distant. The primary component in the Sigma Orionis system is a double star, Sigma Orionis AB, composed of two hydrogen-fusing dwarfs separated by only 0.25 arc seconds. The brighter star is blue. It belongs to the spectral type O9V, and has an apparent magnitude of 4.2. The companion belongs to the spectral class B0.5V and has a visual magnitude of 5.1. The two stars orbit each other every 170 years. Sigma Orionis C is a dwarf star belonging to the spectral type A2V. It has an apparent magnitude of 8.79. Sigma Orionis D and E are also dwarfs. Both belong to the spectral type B2V and their respective magnitudes are 6.62 and 6.66. Sigma Orionis E is notable for being exceptionally rich in helium. 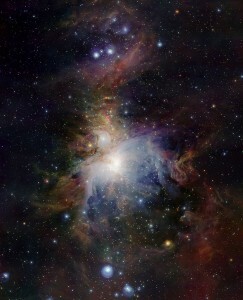 Tau Orionis belongs to the spectral class B5III and is 555 light years distant. With an apparent magnitude of 3.59, the star can be seen without binoculars. Chi-1 Orionis is a main sequence dwarf, only 28 light years distant from Earth. It belongs to the spectral type G0V and has an apparent magnitude of 4.39. It has a faint red dwarf for a companion, with an orbital period of 14.1 years. Gliese 208 is an orange dwarf, belonging to the spectral class K7. It has an apparent magnitude of 8.9 and is only 37.1 light years distant. The star is believed to have passed only 5 light years from the Sun approximately 500,000 years ago. V380 Orionis is a triple star system that lights the reflection nebula NGC 1999, located near the Orion Nebula. The nebula has a huge hole of empty space appearing as a black patch in its central region. The reason why the patch appears black has not yet been determined, but one theory suggests that narrow jets of gas from the neighbouring young stars may have punctured the sheet of dust and gas in the nebula and strong radiation from an older star in the region may have helped create the hole. The nebula lies about 1,500 light years from Earth. V380 Orionis belongs to the spectral type A0 and is approximately 1,000 light years distant. GJ 3379 is the nearest Orion constellation star to the solar system. It is located only 17.5 light years away. It is a red dwarf, belonging to the spectral class M3.5V, with a visual magnitude of 11.33. GJ 3379 is believed to have come within 4.3 light years from the Sun about 163,000 years ago. The Orion Molecular Cloud Complex, or simply the Orion Complex, is comprised of a large group of dark clouds, bright emission and reflection nebulae, dark nebulae, H II regions (large clouds showing recent star forming activity) and young stars in the constellation Orion. 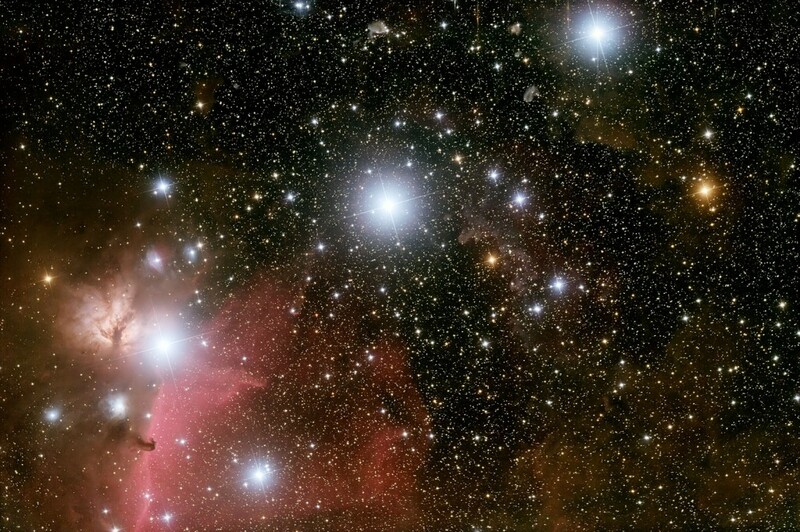 The Orion Complex is between 1,500 and 1,600 light years distant. Several parts of it – the famous Orion Nebula, for one – can be seen with the naked eye. The Orion Molecular Cloud Complex contains most of the well-known deep sky objects in Orion: the Orion Nebula, Barnard’s Loop, the Flame Nebula, the Horsehead Nebula, Messier 43 and Messier 78. The Orion Nebula, or Messier 42, is a diffuse emission reflection nebula located south of the three stars that form Orion’s Belt. Sometimes it is also called the Great Nebula or the Great Orion Nebula. The nebula is one of the brightest ones in the sky and can be seen without binoculars. It has a visual magnitude of 4.0 and is 1,344 light years distant from Earth. To the naked eye, the Orion Nebula appears as the slightly blurry central “star” in Orion’s Sword, south of Orion’s Belt. Messier 42 is the nearest known region of massive star formation to the solar system. It is part of the Orion Molecular Cloud Cluster. The Orion Nebula contains the Trapezium, or the Orion Trapezium Cluster, a very young open cluster easily recognizable by its four brightest stars, which form a trapezium-shaped asterism. The Trapezium is a young, tight open star cluster located in the centre of the Orion Nebula. It is 47 arc seconds in size and has an apparent magnitude of 4.0. The cluster was first discovered by Galileo Galilei on February 4, 1617. He drew three of the stars (A, C and D), and the fourth one was added by observers in 1673. By 1888, eight stars were discovered in the cluster. The brightest five emit most of the light that illuminates the surrounding nebula. The Orion Trapezium Cluster is easily identifiable in the sky by the asterism formed by the four brightest stars, A, B, C and D.
The brightest and most massive star in the cluster, component C, is Theta-1 Orionis C, a blue main sequence star belonging to the spectral class O6pe V. The star has a visual magnitude of 5.13 and is approximately 1,500 light years distant. It is one of the most luminous stars known, with an absolute magnitude of -3.2. Theta-1 Orionis C is also the star with the highest surface temperature of any star that is visible to the naked eye: 45,500 K.
Messier 43, or De Mairan’s Nebula, is a star-forming emission-reflection nebula in Orion. The famous H II region was first discovered by the French chronobiologist, astronomer and geophysicist Jean-Jacques Dortous de Mairan in 1731. Charles Messier later designated the nebulosity Messier 43 and included it in his catalogue. De Mairan’s Nebula is part of the Orion Nebula, but separated from it by a large lane of interstellar dust. It has an apparent magnitude of 9.0 and is 1,600 light years distant. The nebula is located about seven arc minutes north of the Trapezium cluster. 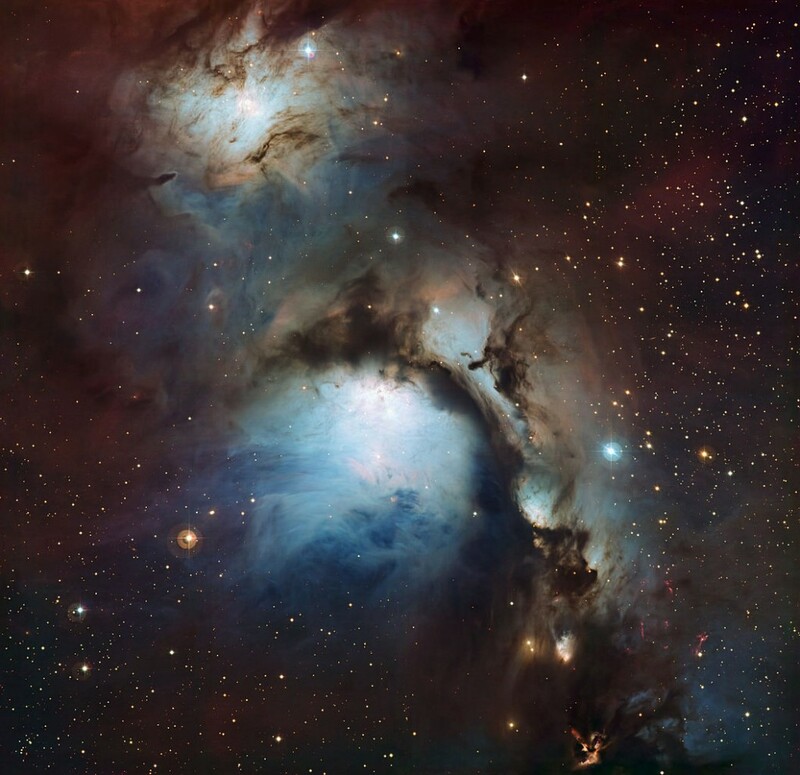 Messier 78 is a reflection nebula in Orion. It was first observed by the French astronomer Pierre Méchain in 1780 and included in Messier’s catalogue later that year. The nebula surrounds two 10th magnitude stars and can easily be found in a small telescope. It also contains some 45 T Tauri type variables, young stars still in the process of formation. Messier 78 has a visual magnitude of 8.3 and is 1,600 light years distant. The Horsehead Nebula, also known as Barnard 33, is a famous dark nebula in Orion. It is located south of Alnitak, in the bright emission nebula IC 434. The Horsehead Nebula is approximately 1,500 light years distant. It was discovered by the American astronomer Williamina Fleming in 1888. 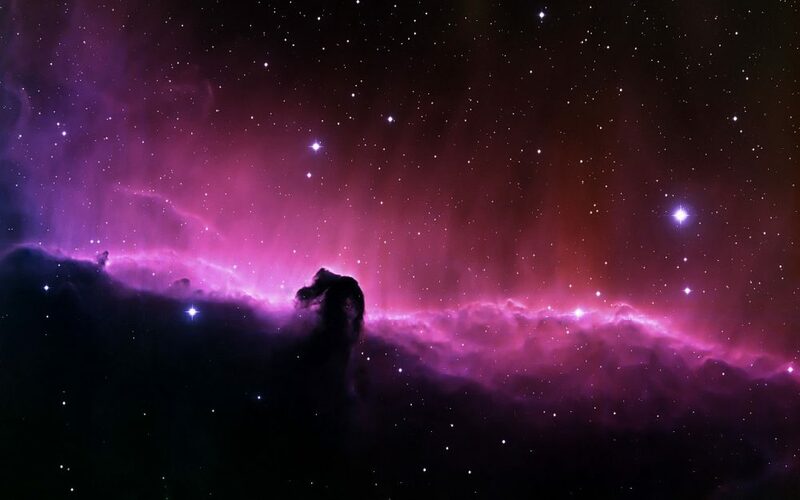 The nebula got the name Horsehead because of the shape formed by the dark dust clouds and gases, one that resembles the head of a horse when observed from Earth. Barnard’s Loop is an emission nebula located in the Orion Molecular Cloud Complex. The nebula has an an apparent magnitude of 5 and is about 1,600 light years distant from the solar system. It is believed to have originated in a supernova explosion about two million years ago. Barnard’s Loop was named after E.E. Barnard, the astrophotographer who photographed the nebula and published a description in 1894. Barnard’s Loop is approximately 150 light years in radius and it covers much of the Orion constellation. It appears as a large arc centred on Messier 42 (the Orion Nebula). The loop is believed to be ionized by the stars located in the Orion Nebula. The Flame Nebula is an emission nebula in Orion. It has a visual magnitude of 2.0 and is between 900 and 1,500 light years distant. 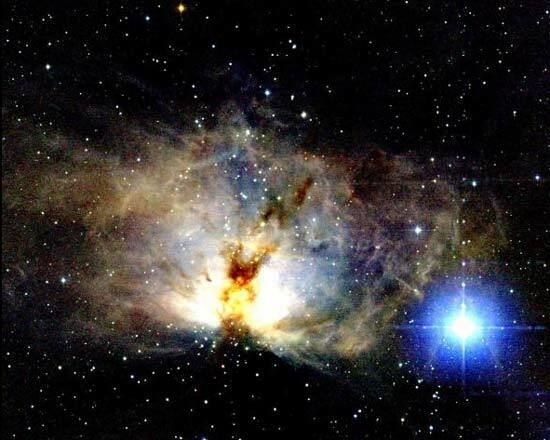 The Flame Nebula is illuminated by the light of the hot blue supergiant Alnitak, the easternmost star in Orion’s Belt. Alnitak emits ultraviolet light into the nebula, knocking electrons away from the hydrogen gas clouds inside the nebula, and the glow of the nebula is the result of the electrons and ionized hydrogen recombining. 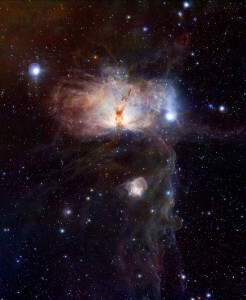 The Flame Nebula resides in the Orion Molecular Cloud Complex. 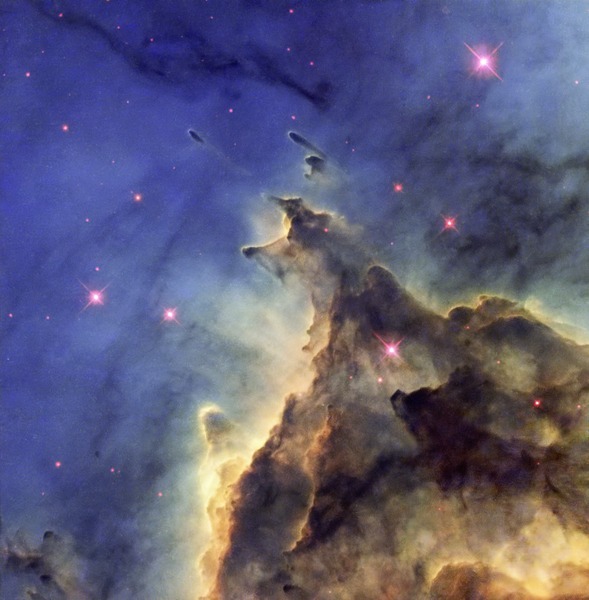 NGC 2169 is an open star cluster, approximately 3,600 light years away from the solar system. It has an apparent magnitude of 5.9. The cluster was originally discovered by the Italian astronomer Giovanni Batista Hodierna in the mid-17th century and then later independently spotted by William Herschel on October 15, 1784. It is sometimes called The 37 Cluster because it resembles the number 37. NGC 2169 is just under seven arc minutes in diameter and consists of about 30 stars, which are only eight million years old. The brightest one has an apparent magnitude of 6.94. NGC 2023 is a reflection nebula in Orion constellation. The nebula is notable for being one of the brightest sources of fluorescent molecular hydrogen. It is lit by the B star HD 37903, the most luminous star lighting the surface of the molecular cloud Lynds 1630 (Horsehead Nebula, or Barnard 33), and one of the largest reflection nebulae in the sky. It is four light years wide. NGC 2023 can be found a third of a degree from the Horsehead Nebula. It is 1467.7 light years distant from Earth. NGC 2174 is an emission nebula classified as an H II region. 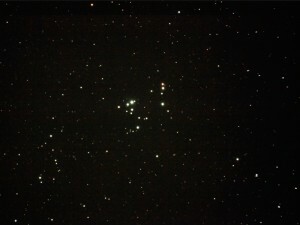 It is associated with the open cluster NGC 2175, also located in Orion. The nebula is approximately 6,400 light years distant. It is also known as the Monkey Head Nebula because of its unusual shape in wide field images.